Don't be fooled, this post is actually about Domenico Scarlatti, whose music I will eventually compare to that of John Coltrane and Erik Satie. But the story really starts over 35 years ago at Carleton College in Northfield Minnesota. And it ends with the line "Once Upon A Time". To honor the positive accomplishments Carleton made towards educating me I send them token donations every year. In exchange they send me wall calendars so saturated with nostalgia that I instantly toss them out. These days Carleton also emails alumni newsletters replete with something called "E-NEWS". 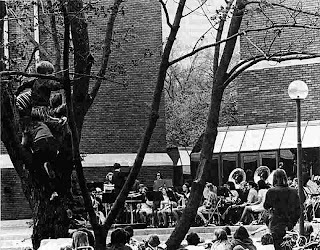 Recently E-news announced that every issue of the school newspaper, The Carletonian, had been digitized and posted online at ArcaSearch. I immediately did the most natural thing, I searched the archive for my own name. It turns out that during my senior year I wrote a number of concert reviews and promotional pieces. I had completely forgotten all of them except one. The one article which hadn't escaped my memory was a review of the William O. Smith/John Eaton Lucas Lectures. Eaton and Smith - It Sounded Better From the Lobby on January 18, 1973. It was very positive article in spite of the subtitle. I also wrote a promo for those concerts: Eaton, Smith, New Music on January 11. I'm sure that event has stayed in my memory because meeting clarinetist William O. Smith really did change my life. I spent the next couple of decades trying to be an avant-garde clarinetist. 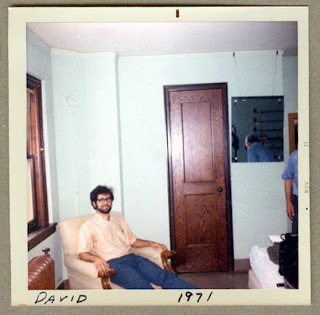 I never saw Smith again - but I did continue to explore the boundaries of clarinet performance and even played his solo clarinet music from time to time (for example, check out the program at the end of this post). He deserves a long overdue thank you. Here are three more reviews. Reading these brought back a flood of useless memories. In my biased opinion, the 490 odd Demenico (sic) Scarlatti harpsichord sonatas are the most enjoyable pieces ever written (and I will defend myself against all who disagree, but I will never deny that I am right). It is not odd, therefore, that I thought that the performance of five of these sonatas was the high point of the concert. No more discussion is necessary. My propensity to make grand sweeping generalizations of what constitutes good (or bad) music has remained the same (or maybe even increased) over all these years as well. My initial exposure to Scarlatti was probably from the four sonatas on the album The Well-Tempered Synthesizer4. As a beginning piano student at Carleton I advanced far enough to play a few myself, naturally having my mind stretched while happily banging out some of the cluster harmonies on a piano. And I acquired a 3-LP set of Fernando Valenti playing several dozen sonatas, noting sadly that he had recorded hundreds of others which I could not find. When I got to CalArts Valenti, who was on the faculty, gave an all-Scarlatti concert. He worked hard to bring the emotions of the pieces out - way out, nearly collapsing in "tears" onto the keyboard of his harpsichord at the end of one poignant sonata. Ever since then that performance has defined the phrase "milking it" in my mind. 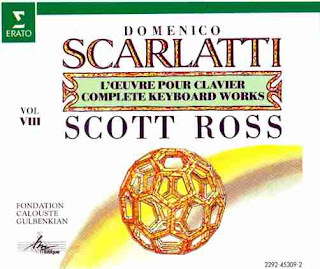 Years later the first complete set of Scarlatti sonatas by Scott Ross became available on 33 compact discs. I found out about the set when the local Pacifica station KPFK devoted all their daylight airtime during a holiday weekend to broadcasting the whole thing. I listened intently. The presenter was William Malloch (here or here or here for bits of info) who rationalized the broadcast to the audience (and perhaps to the station management) as a tribute to Ross, an early victim of Aids, rather than as an opportunity to experience some great music. Whatever. It worked. The form and style of each sonata is remarkably consistent throughout the cycle. A modern composer could never imagine writing so many similar pieces. The closest modern equivalent, if you ignored the issue of lyrics, might be a prolific popular songwriter. Multiple Scarlatti sonatas become a bubbling stream of constantly fresh ideas in which twists of melody, harmony and rhythm are always floating past. The underlying sonata structure provides some cohesion. The overall effect reminds me of John Coltrane soloing on, say, My Favorite Things - putting out idea after idea while the rhythm section vamps happily in the background. If you consider the massive length of the combined Scarlatti sonatas they can be compared to another keyboard piece, Vexations by Erik Satie. Vexations is a short gnarly dissonant bit of piano music which the composer instructed was to be repeated 840 times during a single performance.5 Of course the actual musical content couldn't be more different. Scarlatti is tasty and rich - a true physical pleasure. Satie is just a few seeds and stems, memories from the bottom of the bag. I also own a complete recording of all the Haydn symphonies conducted by Antal Dorati. This represents about the same quantity of music (and same number of discs) as the Scarlatti. The difference is, as you progress from symphony to symphony chronologically, you can hear Haydn working out his ideas, changing over time. He created the form by trial and error, adopting and discarding things. This is completely different than the way I perceive the Scarlatti. I'm not suggesting a value judgment between these two massive bodies of music. Rather I'm making an observation about the purposes, personalities and careers of the two composers as viewed abstractly through the artificial lens of nearly three dozen compact discs each. Finally, I've noticed that my interest in Scarlatti does not change according to the medium or performer to which I listen. My iPod currently has four different interpreters - Ross, Valenti, Horowitz and Carlos - on harpsichord, harpsichord, piano and Moog. I enjoy all of them. My affinity for Scarlatti is directly to the music itself. There is some ineffable, magical quality of his writing which resonates naturally with me and my tastes andmy preferences. It's a wonderful thing - which I can't really explain - and which I don't really understand. 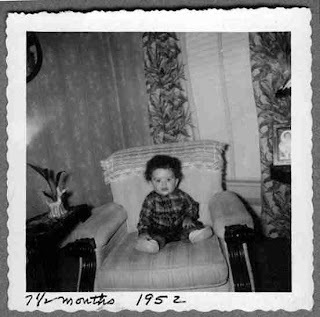 This was my Grandmother's chair. I wonder if it is still at Carleton, passed down from graduates to undergraduates year after year since 1973 - and hopefully cleaned or reupholstered on occasion. 2 The Complete Scarlatti Sonatas performed by Scott Ross on Warner Classics here. 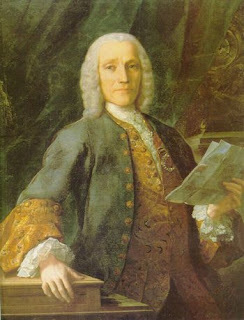 The Wikipedia entry on Scarlatti indicates that two more complete sonata cycles are in production, one on harpsichord the other on piano. The Scott Ross wikipedia link. Pdfs and funky sound files of a bunch of sonatas available at the Werner Icking Music Archive. Domenico's picture came from here where you can find Midi files of all the sonatas. 3 Here's another Mixed Meters article about a college-era favorite composer about whose music my opinion has since changed. 4 Listening to the Well-Tempered Synthesizer album for the first time after several decades was a real trip for me. At first I was shocked by the "antique" analog synthesized sounds. But after a short time my disbelief was suspended and I relived a perfectly wonderful experience. I also realized that my use of stereo effects in my current music probably ultimately derives from their use in the Switched On albums.